Who is Ben and Who is “I”? Ben and I Play for Peace – Austin was an incredible, jam packed weekend for Ben, for me, and for everyone involved. Our concert was hosted by Concordia University – TX and supported by every part of the university community. Ben and his mom Helen arrived in Austin at midnight from San Francisco. Unable to sleep from the excitement, I was awake when they called from the airport to check in. I had been talking with flutist Ellen Johnson who had arrived a couple of hours before from Kansas to perform, and composer Ben Verdery who called from New York City to give some last minute encouragement about the piece he wrote for Ben and I to premiere. The next morning began early with a 6:45am appointment with Austin FOX 7’s morning show, and ushered in a day-long press run. Ben, Helen, and I had not seen each other since the guitar festival in Maui, so we had a fun reunion on the sidewalk! We were met by Melinda Brasher, Concordia’s PR coordinator, who did an incredible job setting up interviews and prepping the newscasters and radio hosts. 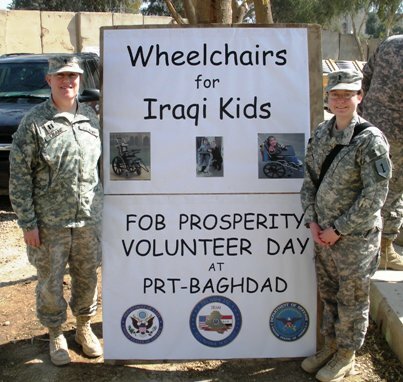 Once inside FOX studios, Ben and I fell right into the groove of talking about our partnership, the participation of composer Ben Verdery and the musicians in Sarasota and Denver, and the amazing work that Wheelchairs for Iraqi Kids does in partnership with the US Army. After FOX, we took Ben and Helen to Austin’s famous Kerby Lane cafe and to the UT tower, and then it was time for our public radio interview at KUT Studios. Austin radio icon John Aeilli was very enthusiastic about our project and kept us on the air for a long time! Outside afterwards, we ran into Matt Hinsley from the Austin Classical Guitar Society and guitarist David Russell! After a brief hello, we were off to ABC studios. Ben did a fantastic interview there, and after a short lunch we continued on to CBS studios! Twelve hours later, we were happy and tired and looking forward to Saturday. Saturday was preparation day. Ben and I spent the day at Concordia’s concert hall rehearsing Ben Verdery’s piece “Tibetan Prayer”. Melinda and her PR team, who had been working for months on publicity, were coordinating press for Sunday. My team of 40+ student volunteers were continuing the sale of last minute tickets and t-shirts. The Austin team of musicians were rehearsing their solos, quartets, and duos. That evening, Matt Hinsley introduced Ben and our concert just before David Russell performed on the International Concert Series. The concert was wonderful, and Ben enjoyed talking with David afterwards. On Sunday, Ben and I arrived at the university early. The students were there setting up the tables with tickets, t-shirts, raffle items donated by Texas country stars Kyle Parker and Aaron Watson, and free gifts donated by our generous sponsors D’Addario Strings and the National Guitar Workshop. Ben spent a few moments talking to the students and thanking them, and then we all took our places. As the audience began to arrive, we recognized many familiar faces from Austin’s music community and from the university. Concordia’s president Tom Cedel and his wife Penny attended, as well as our dean Ken Schmidt, and several faculty members. 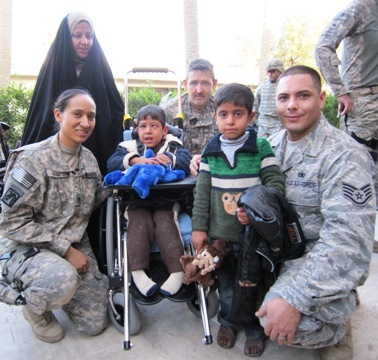 We were thrilled when we saw Basma Wainerdi from Wheelchairs for Iraqi Kids and her entire family! A moment later, we were surprised by camera crews from Channel 8 News and NBC! The concert was a joyful and musical experience with performances at the highest level. Ben and I both had the opportunity to introduce the project, and Ben showed a moving slideshow of pictures from WFIK’s work in Iraq. We also took a moment to remember Ben’s teacher and mentor, Frank Longay, who had passed away a month before. When Ben and I premiered “Tibetan Prayer,” there was a surprise from Brad Blauser in Iraq! Brad, the kids, and the soldiers had taken a day’s worth of pictures and sent them to me. Melinda and Jesse Gumtow had taken them and created a slideshow that was played behind us as we performed. At the end, Basma read a letter from Iraq and thanked everyone present. We all continued the celebration with a reception donated by Tina Haley of Concordia’s food services. At the end of the concert, on the way to some of Austin’s best Mexican food, Ben and I checked in with Martha and Tenly in the other cities and got a fun phone call from Ben Verdery and the D’Addarios. On that day, we raised a total of $5,200.00 and the total was climbing… A successful experience all the way around!